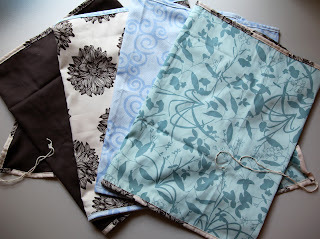 Green Bag Lady: Ironing Board Tutorial + Organic '11 FREEBIE! Ironing Board Tutorial + Organic '11 FREEBIE! Let's talk about one of my most dreaded tasks. Ironing. Yuck. Don't like it, never have. It's in the genes. My mom had an aversion too. We even had an ironing lady when I was a kid. Yup, just ask Bagette Dad. This is what happens, I let my ironing pile up to an unimaginable amount and then I break down and watch TV one night an iron it all. Well, during one of these "all nighter" ironing sessions a few years ago, I noticed that my ironing board cover really smelled…like chemicals. That can't be good. I concluded that it was NOT good to heat and reheat this cruddy piece of fabric that came with the board and the foam that was underneath it. Ugh. I looked into new covers and came up with this one. I splurged, but it was better than breathing toxic chemicals every time I finally did the ironing. Flash forward to this week. I bought myself a new ironing board. The old one of 18 years rocked back and forth when used and was literally on its last leg. Of course, I took my nice cover off the old one to put on the new one. However, it is quite a boring cover, only natural color and all. The light bulb went off in my tiny brain that I could use Harmony's fabric and make myself a nice new pretty cover! Oh yes! --1.75 yards of quilting cotton or similar fabric, If you are using Harmony's organic cotton sateen then you only need .66 (2/3) yard because her fabric is so wide!!! --4.75 yard of cotton string (found most anywhere, hardware store, WalMart, etc.) just try to find something similar to the string you see on your old cover, or take the one out of your old cover and reuse it! Take the old cover off and stretch it out so the string is no longer tight. It will look something like this. Put that cover on top of your fabric and trace around it. Note: It does not have to be perfect, all the edges will be underneath your board so you won't see them. Serge or zigzag stitch around your cover. 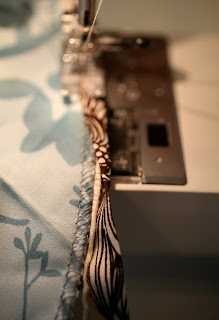 You can probably skip this step, but I wanted to reinforce the fabric since it is pulled so tightly. All you have to do is fold over the top of your bias tape before you sew. That's it! Now, put your three supplies together like this. Cover on the left, binding on the right and tuck the string into the fold of the binding. REMEMBER TO LEAVE ABOUT 8 inches OF STRING STICKING OUT OF THE TOP! You will need this to pull the cover tight. Pin these all together so you can start sewing, make sure the string is really tucked into the fold, you DO NOT WANT TO SEW ON THE STRING! Lower your presser foot carefully on the left of the binding. You want to catch both sides of the tape while you are sewing while NOT sewing on the string! 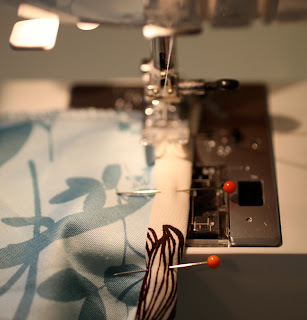 Start sewing, keep tucking the string into the fold, you can pin all of this if you like. When you have sewn all the way around the cover, cut your bias tape about 1.5 inches from the end of the cover. Cut the string 8 inches from the end of the cover. …finish the end, don't sew TOO far over the other bias tap, stop short of the string! Put your new cover on and admire your pretty ironing board cover! Since these are so easy, I got in a mood and made 6 of them! One for me, one for Harmony and 4 for YOU! 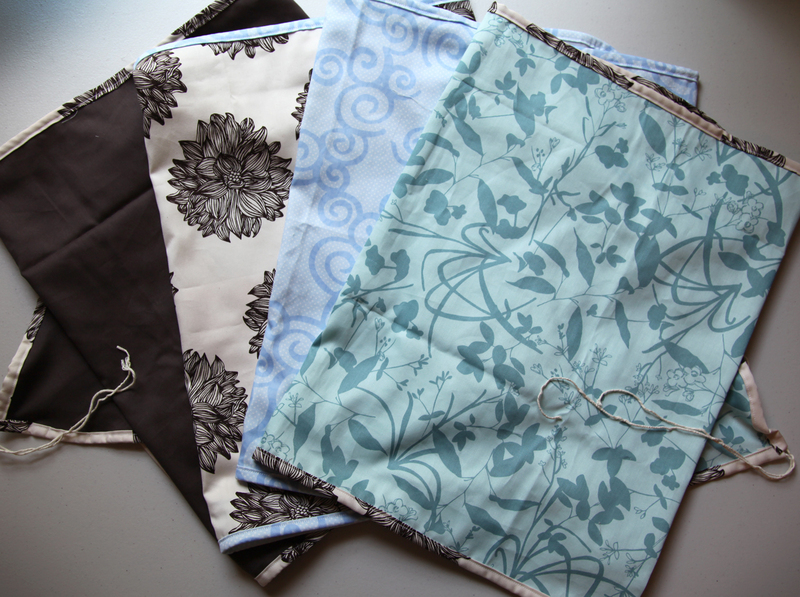 While I was admiring Harmony's fabric, I thought it would be fun to make some organic cotton bags for you too! •In your comment, tell us what household task is NOT your favorite! •DEADLINE FOR THE FREEBIE IS 10 PM (CST) Wednesday JULY 20, 2011. •THIRTEEN LUCKY WINNERS WILL BE CHOSEN FROM THE COMMENTS TO WIN! This turned out lovely! I need to make one for my mini-ironing board since that's the one I keep out all the time. Thanks for the tute! I've been looking at my ironing board and thought "i should look up a tutorial on how to make one!" and saw your post! Perfect timing! I hope to win one! Anyway, the one household task I don't like doing is taking out the trash. I don't mind doing the laundry, or the dishes, but something about that garbage... Thanks! oh!... I hate ironing! but I really love cotton clothes and I love cotton clothes well ironed...so...no way...I have to iron, it is a Karma. I don't like to iron but I'd take it over cleaning the shower any day! the bathroom is the toughest cleaning job ever...i hate it!! i put it off forever...guilty i am. For those of you who hate ironing... you can buy fabric pre-washed, pre-cut and IRONED from Stitch Simple: http://www.stitchsimple.com/shopping/default.asp How cool is that?! ohmygosh! I am totally putting off to make a new iron board cover. If I don't win I will diffidently make one from your tute! and I LOATHE cleaning the shower. If I wait long enough my hubby does it,,hehehe. I love the cover tutorial! I really need to replace mine soon. I really don't enjoy un loading the dishwasher. I will load the stinky dishes but I don't like putting them away. I would say that my least favorite household chore would be cleaning the cooking range & oven...yuck! This is a great tutorial, exactly what I need ! Thanks for the awesome tute! It came out so pretty. I need a new one on my iron board that is FALLING apart.. LOL..
My least favorite household chore.. cleaning anything.. can I use that?? LOL I would have to say.. Dealing with dirty dishes!!! Hate it, hate it, hate it!!! Thanks again for the tute and the wonderful give-away!! What a beautiful ironing cover! Definitely will make me want to iron! My least favorite household task is cleaning the bathroom, especially the tub and shower, yuck! Thanks for a great giveaway & a chance to win! I heart your new ironing board cover, Teresa! I want a prettyHarmony ironing board cover too. But I'm going to make my own, as my board is not standard size. Thanks for the great tutorial. Wow! Who knew an ironing board could look so beautiful?! My least favourite chore is picking up the seemingly never-ending supply of toys, books, clothes, cups, whatnots, and doodads littered throughout the house every day. Thanks for sharing the ironing board tutorial, the fabric you used was adorable. My least favorite chore is putting away dishes and clean laundry. I don't mind washing the dishes or even folding the laundry but when it comes to that last step I can procrastinate with the best! I am not in love with dusting but do it because I hate dust.....Also want to thank you for the bag I just received in the mail....I LOVE IT and will send picture as soon as someone is with me on a shopping trip. Cooking dinner is probably my least favorite household chore. Can't get everyone to agree....grrr. Thanks for the tutorial. It will be very useful as I prepare to replace my ironing board cover. Cleaning out closets is one of my least favorite chores. However, I love an organized closet so it has to be done! Could use an ironing board cover and/or a bag. Love 'em. email: grace2stay at cox dot net. Thanks for the tutorial, I need to make a new one, it's a mess with alot of sticky stuff. I iron my quilts or sewing projects. NOT our colthes. Least favorite chore is dusting with doing the floors as a close second. The ironing board covers look amazing! My least favorite is dusting...or vacuuming the carpeted stairs. Thanks for the chance to win! Thank you for such a simple project! I got a new ironing board for Christmas (asked for it!) and when I washed the cover, it shrank up so small it won't begin to fit back on the board. I've been putting off making a new one but I think now I'll do it today! Let me now how it turns out!